Why Bother with an MIS? 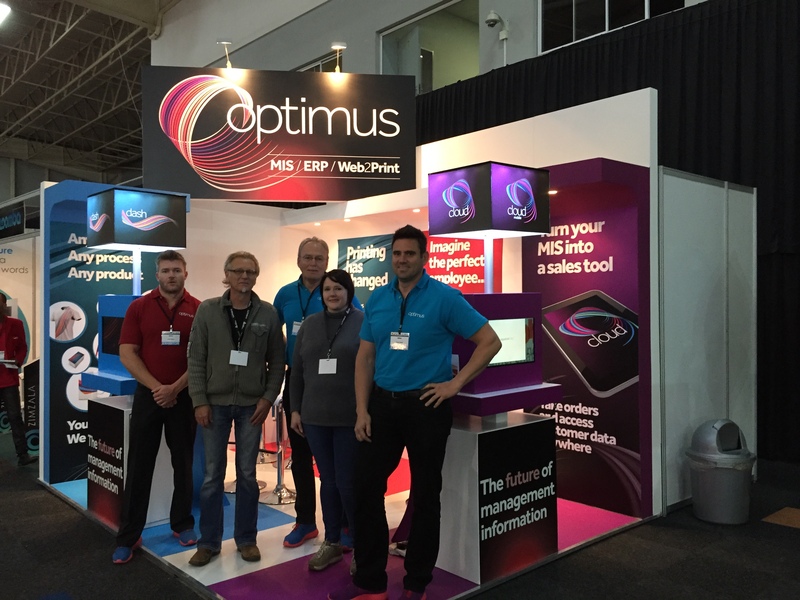 Following the highly successful African launch of the new dash Sales Manager at FESPA Africa, 22-24 July 2015, Optimus are delighted to announce Screenline will be the first Optimus dash MIS user worldwide, to take delivery of the new module. Screenline has been the leading manufacturer of screen printed advertising since 1971. Specialising in outdoor and indoor screen and digital advertising solutions, Screenline provides printed brand activation services for some of Africa’s leading corporate and small businesses. Screenline also partner with top advertising agencies who require printing of the highest quality for their clients. Nicola Bisset, Optimus Group Managing Director states: ‘We are delighted that Screenline immediately identified the benefits of the new dash Sales Manager. We are very excited that such a dynamic and progressive company have agreed to become a beta site; this means they will have direct input and influence into the evolvement of the dash Sales Manager Module. At Optimus, we have a long history of involving customers in our development process. Indeed, the original Optimus MIS, was developed back in the late 1970’s with a beta user and we have continued the successful combination of beta sites with both dash MIS in 2010 (KGK Print – UK) and Cloud Mobile in 2012 (Anglo Printers – Ireland). Optimus Solutions are developed after extensive research and feedback from our Worldwide Customers and some of the best ideas come from our Customers! In partnership with Duplo and its London Calling partners, PrintIT! launches its first long term fundraising campaign, PassIT! The PassIT! fundraising campaign, derived from London Calling 2014 is a collaboration between Duplo and its partners to run a 10 month fundraising campaign to raise awareness and money for Proskills’ Schools into Industry programme PrintIT! Optimus, Antalis, Balreed, Taopix, Vpress, LumeJet, Renz, Neopost, Vivid and Duplo have each been allocated a month in which to organise a fundraising activity. The PassIT! baton will be passed to each partner throughout the year ending with Duplo taking the last month of September before showcasing their results at London Calling 2015. PassIT! was as a result of a brainstorming session with the London Calling partners on how they could do more to promote and support PrintIT! through London Calling. “The concept of London Calling is a workflow between the seed of a printed job, right from the web order to the print to the finishing and through the mailing, it is basically a “chain” of companies linking together. So the launch of the PassIT! campaign through London Calling just seemed a natural progression, to pass the baton up the chain! PrintIT! is an extremely important initiative, for the future of print. We can either sit back and discuss “the good old days” and how tough times are now, or we can embrace change and innovations in modern communication and tell the youth of today how creative, fun and fulfilling the print industry is. PrintIT! bangs the drum for print on behalf of the industry; and that is why we support it. Kicking off the campaign in December is Optimus, a supplier of Management Information Systems to the Printing Industry based in Woking, Surrey. They are planning on cycling 296 miles which is the equivalent distance of the first Gutenberg press in Mainx Germany to Bruges in Belgium where Caxton printed the first English text book. Each team will be named after ‘C’ ‘M’ ‘Y’ ‘K’ (After the colour model CMYK) and will take it in turns to achieve this incredible feat. “The print and graphics industries are embedded in the UK’s heritage and economic landscape as one of the top contributors in manufacturing. We cannot afford to let young talent miss out and we must inspire them at the grassroots level to enter our industries. We need young, flexible and fresh skills to come in or we risk losing growth and innovation. PrintIT! is a fantastic initiative from which we will all benefit. By helping to inspire and teach young people about our industries we are ensuring a continuing stream of new skills, helping us to grow and remain a strong contributor to jobs in the UK and beyond. PrintIT! run by the charity Proskills UK, educates young people about the print, paper and packaging through a curriculum mapped design competition for the Fairtrade Foundation and learning activities. Not only do students get a hands-on opportunity to experience these industries they also gain an insight into the potential careers, apprenticeships and training they offer. “The PassIT! campaign is such a fantastic initiative to which we are very grateful to Duplo and its London Calling partner print and paper companies for organising this wonderful charitable initiative to support the Proskills PrintIT! schools programme. PrintIT! aims to inspire and educate as many students as possible without any cost to schools. This work would not be possible without the generous support we receive from the print and paper industries. Launched in 2005, PrintIT! is an industry-wide educational initiative which aims to encourage young people to consider a career in print. As part of the curriculum-based PrintIT! course, students are challenged to create a print-based campaign. Aiming to promote the many varied and stimulating career paths available within the print industry, the PrintIT! competition was extended in 2008 to include Year 9 students (aged 13-14) as well as Year 10 students (aged 14-15) studying for their GCSEs in Product Design and Graphic Products. PrintIT! is also relevant to the Diplomas in Creative and Media and Manufacturing and Product Design. PrintIT! is led by Proskills UK, the standards setting body representing the print and paper industries. For more information please contact the PrintIT! team on 01235 432030 or printit@proskills.co.uk. Proskills UK is a registered charity [no: 1155635] which helps to raise the profile; sets the skills standards and qualifications, and ensures that the skills and funding system delivers against the current and future needs for these industries. 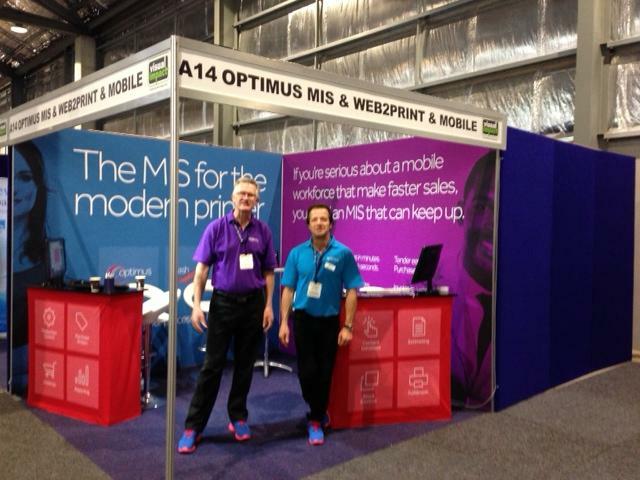 Optimus Australia Espera dar la Bienvenida a A14 permanecer, Pabellón 5 de Visual Impacto Sydney Olympic Park. The Optimus team at FESPA Africa 2014 are delighted to announce we have won another award! This time not for our software, but for being the best small stand up to 18 sqm at the show. Come and see us at The Gallagher Convention Centre Johannesburg; its not too late! Getting ready for a busy three days at The Gallagher Convention Centre, Johannesburg. Optimus welcomed our International Team to Woking Head Office this week for an update on the exciting developments within Optimus dash . After a hard day training, it was time to celebrate being together, sharing anecdotes and experiences. 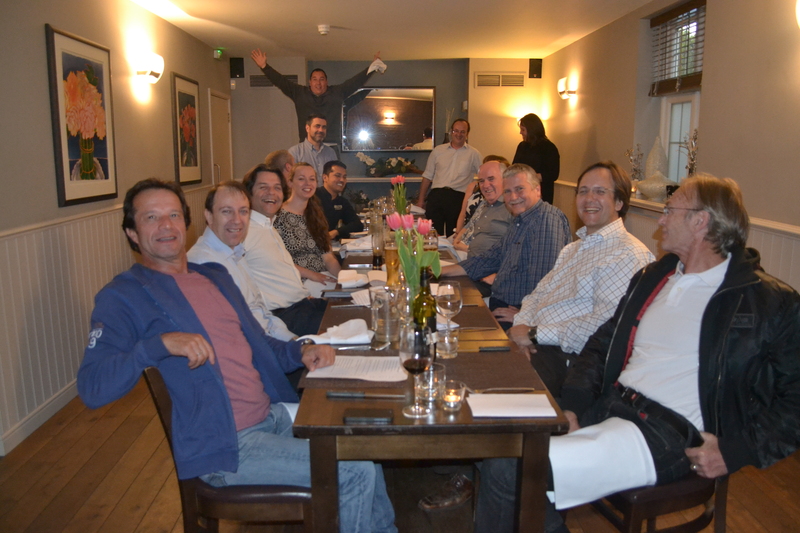 As you can see from photo 2, Ed Carney, UK Business Manager, got a little excited at the back of the room! 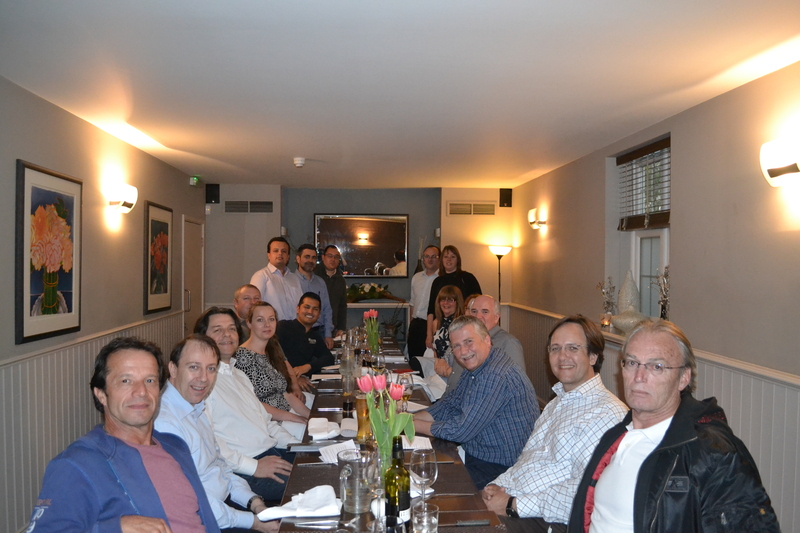 Countries represented were UK, Spain, Colombia, Italy, The Netherlands, Germany, Australia and South Africa. A great night was had by all!!! Following the recent announcement of KBA’s partnership with Optimus for the worldwide sales and distribution of their management information systems (MIS), this new collaboration has already started to bear fruit in Singapore. A local printing house will be implementing the Optimus Dash MIS in the near future. Health, money and prosperity is what everyone wishes for during the Chinese New Year. To kick-off the Lunar Year of the horse successfully KBA Asia Pacific invited customers from various print shops throughout Singapore to an informative event that promised exactly that: a tool to increase efficiency, save money and boost profitability. The seminar took place at the German Centre in Singapore on 20 February. After starting their day with a Bavarian breakfast the print experts were welcomed by KBA Asia Pacific managing director Stefan Segger. Optimus Director and co-owner Henny van Esch, LogoTronic product manager Chris Waschke and KBA IT-specialist for system integration Martin Beer travelled to Singapore to present an overview of KBA and Optimus workflow modules and their functionalities, which included a live demonstration of the interaction of both systems. “Apart from our printing technology KBA LogoTronic and Optimus Dash MIS, either as stand alone solutions or in combination, offer our customers solutions that help them become even more efficient by optimizing all surrounding processes and activities”, says Chris Waschke. Major advantages of the Optimus Dash are its flexibility and user-friendliness. “Too often various systems are in use in a company’s different departments. Such so-called networked islands hardly ever contribute to more efficiency. Optimus Dash together with LogoTronic Professional, on the other hand, presents a closed-loop workflow solution tailored to the needs of each individual customer. It even offers the possibility of integration with existing subsystems if that’s the customer’s wish”, explains the product manager. The first order for an Optimus Dash MIS placed by a print firm in Singapore was already finalised during the visit of the experts from Europe. All of the company’s printing presses will automatically feed data into the systemusing connect boxes and post-press equipment will be connected via user-friendly browser interfaces. From the quote to the finished print product and even through to shipping, with a setup like this all data has to be entered into the system only once and it is made available across all departments. The management level in particular will soon benefit from the data that helps identify optimising potential.